Worker safety in the oil and gas industry has improved dramatically over time, and working in the field is a much safer occupation today than it has been historically. Despite residual risks, employment opportunities in the oil and gas industry have increased wildly recently, as we’ve written about before. The industry has identified many chemicals and natural hazards and mitigated the risks by setting regulations and standards in place to ensure the safety of employees. For instance, oil and gas drilling personnel may be working in areas with a high concentration of hydrogen sulfide, or H2S, which can cause serious injury or even death upon exposure. H2S is a highly toxic, colorless gas that appears naturally as a result of organic decomposition. The gas can be identified by its rotten egg smell, and prolonged exposure to the gas can damage the senses, leaving people without the sense of smell. Since H2S gas is heavier than air, the most concentrated hydrogen sulfide levels are found closer to the ground, making the gas potentially fatal to workers who pass out in its presence. The oil and gas industry and its safety and regulatory commissions have addressed the problem of H2S exposure to reduce the risk of harmful injury or death on the job. When working in areas where high concentrations of H2S are present, workers must complete the required training courses before starting their assignments. Most workers are also required to wear H2S gas detectors and oxygen tanks at all times on the job. Working in pairs with oxygen tanks is another common way to reduce the risk of an H2S incident. If one worker should lose consciousness because of exposure to H2S, the second worker can provide the fallen worker with oxygen from their tank, move their partner out of the area, and then call for help. 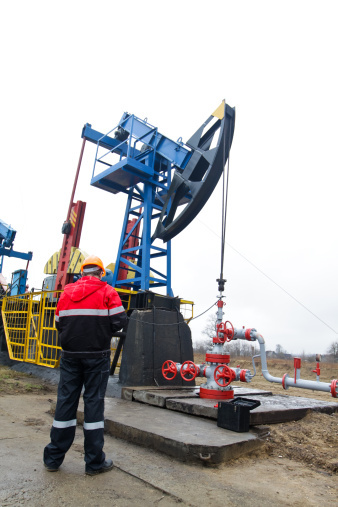 The Occupational Safety and Health Administration (OSHA) keeps a very close eye on all employers in the oil and gas industry to ensure employees are provided the necessary equipment and hazard training. Employers and employees must be in compliance with OSHA standards and all rules, regulations outlined in the OSH Act of 1970. To reduce the risk of burns caused by explosions, workers are required to wear flame retardant clothing, boots, and hand protection while working around flammable and combustible materials. Even with the abundance of training, certifications and protective equipment required in the oil and gas field, unfortunately accidents and injuries can still occur. The industry is, and has been, working around the clock to come up with safer methods and processes to make working around heavy machinery, natural elements, and other materials safer for all industry employees. © 2013 Universal Royalty Company.